Another year, another amazing adventure in Colombia with Bill Dragoo. Come and join Bill and Elephant Moto on a once in a lifetime ride. Colombia is THE hottest motorcycle riding destination in South America, come and discover first hand what it is all about. This is a dual purpose adventure tour, we will be riding some of the most amazing dirt and paved roads this country has. We will discover a Colombia few have seen. Come and find out why Magical Realism was born in this country. This is a point A to point B tour. We begin in Bogotá and finish off in style in the beautiful historic center of Cartagena by the Caribbean. But not before truly diving into some of the most unique and beautiful destinations the country has to offer. We start off in Bogotá and head down the Eastern mountain range towards the jaw dropping landscapes of the Eastern plains. Here we will spend one full day in the peaceful and beautiful natural reserve of Hato La Aurora. A place teeming with wildlife and nature. We will do a Safari through the savannah which at times might make you think we are in Africa. At the Hato, for those interested, we will spend some time doing a refresher off road training course. We will then leave the plains behind and get back into the mountains where we will ride some amazing twisty roads that will take us through colonial haciendas and towns forgotten in time. We will ride Colombia's deepest canyon: The Chicamocha. And then drop back down into the valley of the Magdalena river, where the colonial town of Mompos awaits. Home to the first steps of the Colombian independence from the Spanish. We finish off in a high note riding into the jaw dropping sunsets of the walled city of Cartagena. A UNESCO world heritage site. After this journey we will have plenty of stories to share for a lifetime. Don't let them tell you about it, pack your bags and get ready for an unforgettable adventure. We pride ourselves in providing the opportunity to share stories that will last a lifetime. Road Conditions: 50% gravel and dirt roads. 50% paved roads. As a moto-journalist, a BMW certified off road instructor, and Certified Motorcycle Safety Foundation Rider Coach, Bill Dragoo never strays far from adventure. Setting goals since his Eagle Scout days, Bill is also a certified flight instructor, has earned commercial pilot ratings in powered aircraft, seaplanes and sailplanes, is an accomplished sky diver and scuba diver, and has won numerous competitions in motocross, cross-country mountain biking, sailboat racing, and adventure riding. 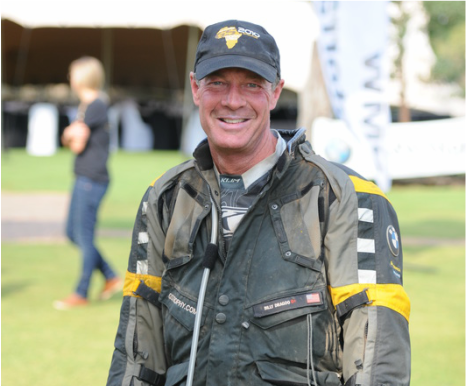 He has been on the podium at the Rawhyde Adventure Rider’s Challenge two of the three times he has competed, with first and second place finishes, and represented his country as one of three men competing with Team USA in the 2010 BMW GS Trophy held in South Africa. Bill has won two Tour de Dirt mountain bike state championships, has completed a double century bicycle ride (200 miles in a single day) and has fulfilled his dream of an unsupported, solo transcontinental bicycle ride across the northern tier of the United States. He has ridden motorcycles on five continents and has hiked through the Himalayas to Mount Everest Base camp with his lovely wife Susan. 3. Yopal - Hato La Aurora. 4. Hato La Aurora (rest day - Safari - Training). 5. Hato La Aurora - Sogamoso. 7. Barichara - Sabana de Torres. 8. Sabana de Torres - Mompos. ​*PREVIOUS OFF ROAD EXPERIENCE ON BIG BIKES IS A MUST. 9 nights accommodation in handpicked exceptional hotels and locations. Mix of boutique hotels, cabins, and local accommodation. 2 motorcycle guides and instructors. 8 day motorcycle rental with unlimited mileage, motorcycle insurance. Support vehicle for luggage, water, spares and tools. Boat ride in La Miel river. 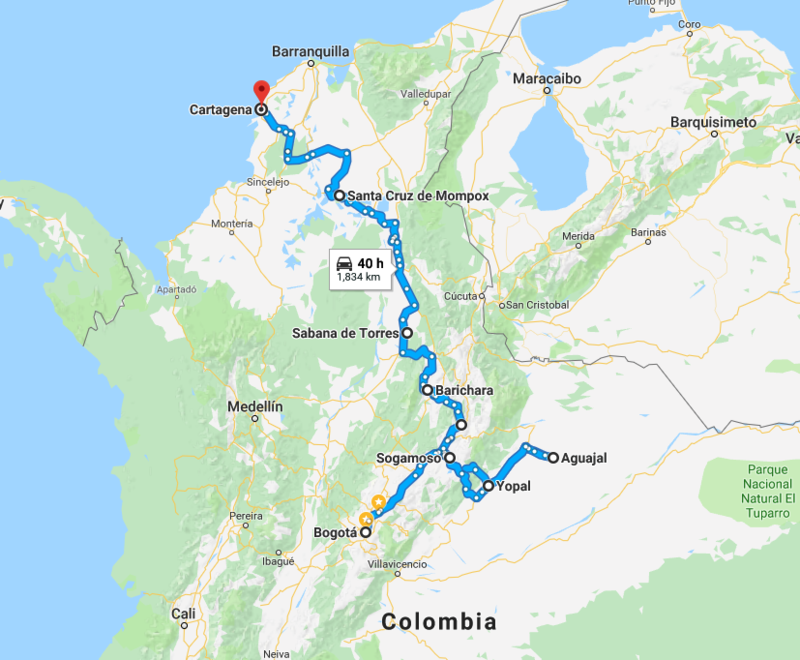 ​Motorcycle transport from Cartagena to Bogotá. Arrival city is Bogotá (BOG). Travel and Medical Insurance. (we highly recommend you purchase a good travel and medical insurance for any unforeseen mishaps. Excursions not mentioned in the tour inclusions. Helmet and protective gear. (Please bring your own gear). Motorcycle luggage (Tankbags, panniers, etc can be rented). Prices are based on shared accommodation. Single accommodation is available on some hotels. Tour occupancy is 8 minimum, 10 maximum. Deposit is $500 USD and guarantees spot on tour it is non refundable. We reserve the right to change price in case the tour does not meet the minimum number of participants. If you feel comfortable riding 2 up in the dirt this tour is manageable. If you don't feel to comfortable you can always ride the paved sections together and jump in the support vehicle when things get a little more difficult.